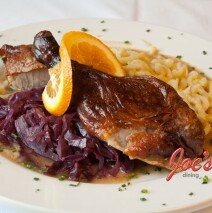 Succulent and crispy, roasted duck served with Bavarian braised red cabbage and home made Spaetzle. A three day process of salt-curing, blanching in honey water and roasting at high temperature insures a beautiful color, crispy skin and moist tender and flavorful meat. The sweet and sour braised red Cabbage balanced perfectly with the home made fresh pasta from the Schwaben-Land.